Legion Branch #49 "House Band"
In addition to our shows, parades and dances, the Mahone Bay Legion Swing Band is the Legion Branch #49 house band for official purposes such as supplying music for the November 11 Remembrance Day Service and other civic occasions. 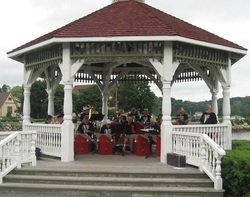 The Mahone Bay Swing Band provides a weekly concert throughout the July and August tourist season from the Mahone Bay harbour-side Bandstand on Main Street, right next to the Save Easy parking lot. The concerts are on Thursday evenings from 7-8 o'clock. In case of rain, we hold a rehearsal in the Legion hall that is open to visitors. July 24: 5 pm - Opening Day Parade - South Shore Exhibition "The Big Ex"